At one time of my reading life, I was pretty crazy about Cecelia's title. It was one collection that I want to ensure it's complete in my shelf. That craze has since passed but I still enjoy Cecelia's titles once in a while. My all time favourite has to be Rosie Dunne aka Love, Rosie aka Where Rainbow Ends which I read about 2 or was it 3 times and this is followed pretty closely by If You Cold See Me Now. 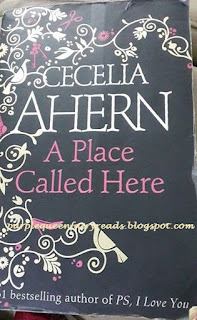 There's a couple more 'flings' with Cecelia's other titles but so far, nothing memorable but A Place Called Here is pretty unique by itself. I am still marveling at the author's creativity and unique imagination in coming out with such one of its kind story line. I know that if I want to read something whimsical and cute, I just have to pick up a title by Cecelia Ahern and that's exactly what I would get...uniquely whimsical and whimsically unique and that's how A Place Called Here is.